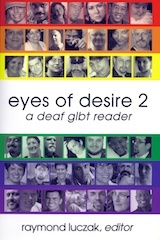 Raymond Luczak published a story of mine in his book Eyes Of Desire 2: A Deaf GLBT Reader, available at Amazon.com. . My story is called “My First Deaf Guy” and it’s about my first lover, who happened to be Deaf, and why we broke up. (It might not be why you think.) I created this blog post so people who read the book and look me up through my bio in the book have a space to leave comments on the story. I edited this post for concision on March 12, 2012. I’m not sure what you mean by “printouts”… I assume you know the lyrics to the song. I don’t know of any video of anyone signing Mary Had a Little Lamb. If she wants to learn how to sign the song, she should learn it from a deaf person who signs fluently. Can anyone help me with my Mary had a little lamb request? Hi my daughter is deaf in one ear and she is going to compete in a little miss pagent and she so wants to sing and sign the song mary had a little lamb. Unfortunately I am unable to find printouts for that is there anyway you can help me? I was thrilled to see your picture on the cover of Eyes of Desire 2. Then I was puzzled to why you, a hearing interpreter, were featured in the book about Deaf GLBT. Thanks for your blog post today, it cleared up my questions I had. I plan to get the book! By the way, I’ll be back in Arizona at the end of November! Can’t wait to see you and Andy during the holidays (if you’re not busy)!